Do you want to look better, feel better, and think better? Do you want to increase your confidence? Do you need to relax your mind as well as your body? 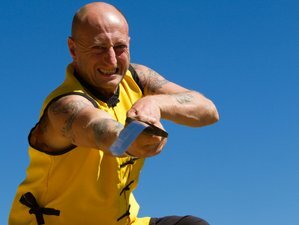 Join Nam Yang Kung Fu Retreat’s most popular course, the Shaolin Warrior Program. Refined and developed since the school's opening in 2008, the program packs in the best elements of Chinese Kung Fu, Chi Kung, and meditation in a way, which has proven to give students just what they want. You will be staying at Nam Yang Kung Fu Retreat. All of the rooms are designed with serious Kung Fu students in mind. Every room has an inspiring mountain view from the front door and a roofed front terrace to sit in the shade and get the benefit of the views and the fresh mountain air. They are within a very easy walking distance of the training facilities and the restaurant. There are two types of room, shared and private rooms. Shared rooms can accommodate two people. They are spacious, have private bathrooms and toilet or washrooms, and are equipped with fans. They are arranged in two buildings, each with six rooms. The front terrace is two meters deep and serves as a social area where students can relax and chat outside of training time. Since most students are complete beginners in Kung Fu, the Shaolin Warrior Program will get beginners off to a strong start from day one. For those with experience, the masters will push you ahead faster. This course is run by Nam Yang Puglistic Association, founded in Singapore in 1954 by Great Grand Master Ang Lian Huat and dedicated to passing on the real arts of old China. Nam Yang has now become an international community with branches in Thailand, UK, Russia, Italy, and Germany. Train with experienced professional teachers, including Master Iain Armstrong in relaxed, constructive atmosphere. Leave your ego behind and become part of the community. This course is taught for westerners. Here in Nam Yang, they understand what you need. Experienced teachers explain complex concepts in clear English. There is no need for translators. 16:30 Technical session: Practice on the routines, including the Shaolin Weapons. Pushing hands. Traditional Kung Fu fighting skills. In-depth training on topics such as breathing, developing the internal organs, training the senses, taking control of your emotions, adopting the right mind set, developing speed, power, and accuracy. After two weeks, you will feel fitter and healthier, enhance your confidence, clear your mind, likely to experience a weight adjustment, improve your flexibility, detox your body, and enjoy your self. Fast, accurate and deadly, the tiger-crane combination is a classic southern Shaolin style which emphasizes intricate hand techniques thrown from a solid and stable stance. Being close to the original Shaolin white crane, this style emphasizes the use of touch sensitivity to connect to an opponent and feel their movement and intention, countering them immediately when they initiate a move, before it can become dangerous. It also uses "springy" power generated from the tendons rather than the muscle. It is the hallmark of genuine Shaolin Kung Fu. The tiger-crane stance is fairly high allowing for mobility and fast stepping. The hand techniques are thrown from close range so as to maximize their chances of success and generally target weak points where they will have the greatest effect. At an advanced level, springy power from the tendons can be used to generate a power which penetrates deeply into the body and affects the internal organs. Ask an instructor for a safe and controlled demonstration. Usually referred to as "Shuang Yang" for short, this is the internal form of the white crane art. It is performed in a very soft, relaxed way, gently opening the chi flow in the meridians, training elasticity into all of the tendons and massaging the internal organs. Whilst superficially very similar to Tai Chi, it is part of the Buddhist Shaolin tradition, rather than the Taoist Wutan tradition. Many people practice the Shuang Yang primarily to benefit their health, vitality, and longevity. Whilst the slow, gentle nature of the training make it ideal for older or less fit people, make no mistake, this is a genuine martial art. The Shuang Yang art uses mostly the bow arrow stance, a longer stance than the tiger crane art. Weight is sunk down and movement is generated from the core of the body, moving out to the limbs like a wave through water. Training connects all of the tendons in the body into one resilient, elastic network with incredible strength. All movements are performed with the whole body. Shuang Yang training is particularly suitable for China. It is the Chinese art of twisting joints, pressing pressure points, and sealing off the flow of breath or blood. As a crane art, the Shuang Yang develops touch sensitivity and encourages sticking to an opponent, neutralizing their attacks and then countering decisively. Shuang Yang training gently stretches and releases the body’s tendons in a slow rhythmic fashion, increasing its strength, and stimulating chi to flow. Shuang Yang practice involves a great deal of flexing and twisting in the torso, as well as opening the meridians and energizing the tendons, which strengthens muscles which we do not usually use. Weapons have always featured strongly in Shaolin Kung Fu training and are one of the most popular parts of the syllabus, even in the modern era. Training starts with simple basics such as how to stand, grip the weapon, and more. This program will also cover simple and advanced moves, strategies, tactics, target areas, and more. The weapon training is not just "show of style." The genuine art of weapon use for combat will be taught. Unlike in many other cultures, the Shaolin weapons were still used for war very recently, such as by the Chinese army in World War II and by Kung Fu groups as recently as the 1970s. Some of the teachers here at Nam Yang have direct experience with these weapons. This is not something which you will find in many schools. Weapon training teaches you to extend your concentration and your energy (chi) beyond your bodies into the weapon. This means that when you go back to freehand training, it is very easy to get your energy right down to your hands and feet. The training works like a sort of weight training: performing with weapons, especially heavy weapons, strengthens your muscle and tendons and conditions you to exert more power. Many techniques are complex and intricate and develop your coordination: this is particularly true of the double weapons. Heavy weapons require a great degree of stability and balance so as to be able to wield them with speed, power, and accuracy. This provides excellent stability training. Many of you are vaguely aware of the great benefits of Chi Kung meditation to your health and longevity but do not really understand how it works. Chi circulates around your bodies, in a daily cycle, mainly but not entirely through pathways called meridians and vessels. Chi is stored in energy centers or reservoirs called tan tiens. The two main sources of chi are the Earth (yin chi) and the sky (yang chi). When the chi in our bodies is circulating freely, and is balanced between yin and yang, you will enjoy good health. Opening the meridians through stretching exercises and guiding chi through them facilitates strong, smooth circulation of the chi. Drawing in fresh chi from the earth and sky keeps our chi plentiful and allows us to balance yin and yang. Expelling stale or excess chi keeps your chi fresh and prevents it becoming excessively strong. By its nature, Chi Kung (also known as qi gong or ki gung) is simple and easy yet amazingly effective. Anyone can practice it successfully, regardless of age or fitness. The essential requirements are a properly trained instructor and good, fresh air. The basic Chi Kung system taught is Tong Ling (clearing and circulating) Chi Kung. Martial Chi Kung goes a step beyond Chi Kung for health. It develops abilities well beyond those of normal people. Mastery of this type of Chi Kung is what enables martial arts masters to perform such "superhuman" feats as punching the ends of bricks, washing in broken glass, rubbing red-hot metal, and being hit with hammers and axes. Vein Tendon Chi Kung is a simple but effective system which tones all of the tendons in the body and increases its elasticity so that it can store energy. Tat Moh Chi Kung is a straightforward system which emphasizes reverse abdominal breathing and therefore trains elasticity into the internal organs, energizing them and making them resilient to injury. The Sum Chien routine from the Tiger-Crane Combination Art is perhaps the most powerful exercise for martial Chi Kung. It involves building elasticity into the whole body and then using it to store energy in the lower tan tien (the lower Chi energy center of the body), releasing it in explosive bursts down to the hands, and then returning it to the tan tien to be used again. It incorporates reverse abdominal breathing and exercises absolutely all of the tendons in the body. Martial Chi Kung can be learned by people of reasonable fitness, male, or female. It takes regular training over a period of time to achieve a high level of skill, but the exercises can be learned in a relatively short space and then practiced anywhere. Meditation forms an intrinsic part of the training program. Generally you are taught how to perform simple, safe meditations and then encouraged to practice them in their own time, quietly and comfortably. On nights of the full moon, a special meditation together at midnight is practiced directly under the full moon. The self-defense training is very practically based and can be tailored to suit the individual. What is emphasized is avoidance as opposed to confrontation (it’s much safer) and techniques, which do not inflict serious injury (killing or maiming an attacker is likely to get you into very serious trouble in most countries, especially if they are a local). Practical self-defense involves forward planning, awareness, positive body language, quick thinking, diplomacy, and confidence. Physical confrontation is a last resort. If it does get physical, take downs and restraints are both good options - they prevent an opponent from hurting you without inflicting injury on them. It may be necessary to disarm them first. The defense techniques that are taught are based on Kung Fu, Chinese boxing and a great deal of experience. The training, which is simple and effective, will enable you to travel without fear. Conditioning and flexibility are vital for any martial artist. At Nam Yang Mountain Retreat, morning meditation and soft arts are complimented by approximately one hour of active workouts and stretches in the afternoon to improve endurance and elasticity. Conditioning routines are borrowed from various martial and athletic disciplines to maximize stamina, cardio, and strength improvement while maintaining safety and a mind for technique. Stretching routines employ methods from both Kung Fu and yoga to greatly improve joint and muscle flexibility and teach body relaxation. Students often notice significant improvements in flexibility and elasticity after leaving the mountain retreat. Craig is a very easy going, popular teacher who can make complex movements seem easy. He is naturally very athletic and keeps up a high level of physical fitness. He has a flair for weapons training and teaches our weapons classes twice a week. He is also interested in San Da (Chinese boxing). He has a deep wish to focus properly on learning and understanding our arts and likes living in the mountains and forests of Northern Thailand with its mix of cultures and ethnicities. Craig is usually present from September to April. This training will take place in Nam Yang Kung Fu Retreat, Pai, Thailand. When Nam Yang Kung Fu Retreat sets out to design the Kung Fu retreat, they looked to make all of the dreams about a perfect Kung Fu, Chi Kung, and meditation school come become reality. Many years were spent in choosing the ideal location then set about building a full time, residential school with all of the elements needed by serious students and teachers alike. Nam Yang Kung Fu Retreat has been perfecting the retreat over the last 10 years and although they are constantly doing some fine tuning and improving, they are now close to the ultimate Kung Fu venue. This is a place where you can live, eat, and breathe Kung Fu. The retreat is set on a 2.1 acres of land on the side of a mountain spur bordering the jungle and with awesome views across the Pai River Valley to mountains which rise steadily to the mighty Himalayas. In the early morning, when you begin training, the mountains are usually shrouded in mist which gradually clears as the sun rises. Indeed, the sun rises are a highlight of many people’s stay. The school is built in the local Shan style architecture according to Chinese Feng Shui principles. The views from the retreat are truly awesome and all of the rooms are built so that when you walk out of your front door you get the full impact! Most of the students say that although the pictures look amazing they do not do justice to the reality! The facilities available in the retreat are two large training areas, both with breath taking views. One is open air, perfect for early morning Chi Kung and the other is roofed and matted but has no wall in order to ensure a constant circulation of fresh air. It is ideal when the sun is hot. There is also a gym. This is divided into a matted training with a hard floor training area and an area with equipment such as the general’s pole, punch bags, kicking dummies, weights, parallel bars, chin up bars, gymnastics rings, and more. It is designed to provide serious Kung Fu students with all that they need. It is not at all a hotel gym. Thailand is a great country with a relaxed, happy positive vibe. This is why it is so popular with tourists. It is easy to travel to, easy to get around in, and easy to get by in English, unlike many countries in Asia! Very importantly, visas are easy to get. The Pai valley is an area of incredible natural beauty. High in the mountains, it epitomizes the Kung Fu dream of training in pure, fresh air with awesome views well away from the distractions of modern life and the pollution of modern cities. It is easy to grow and prepare healthy, natural food in the farmland around Pai and this allows you to eat the sort of diet which best supports our training. This area is famous amongst the Chinese for having some of the best Chi in the world. It flows down from the plateau of Tibet, high in the Himalayas towards the lower land to the south. This make it perfect for the practice of Kung Fu and Chi Kung. Pai is an incredible town with a unique culture. It is massively popular with travelers and has all of the facilities that you might want. It is also a fun town where everyone wants to stay longer. Pai town center is less than 10 minutes from the retreat by moped but cannot be seen from the retreat because of a mountain spur. When you are at the retreat, you will feel that you are right away from the town but to get there when you want is not so difficult. This retreat includes daily breakfast and five evening meals for five days a week. Since there is usually a rather long break mid-day, and students can use that time to go out of the retreat and explore the local area, lunch is not included. However, lunch can also be arranged for you for a surcharge. For most of Nam Yang Kung Fu Retreat guests, the food is one of the highlights of their stay. Quality food is essential for martial artists in hard training. Nam Yang Kung Fu Retreat has their own kitchen garden, herb garden, and fruit trees all of which are entirely organic. Nam Yang Kung Fu Retreat is now partially self-sufficient for fruit and vegetables. What they don’t grow by themselves, they will choose carefully usually from the local farmers' market or from people they know well. The rice is bought from a rather remote hill tribe village in the mountains. By buying rice directly from poor ethnic minorities we support their families. Nam Yang Kung Fu Retreat prepares local style food with an emphasis on the use of beneficial herbs to increase its value. Their diet is calculated to best support your Kung Fu training as they understand that you are what you eat. Food prepared on site is as fresh, organic and healthy as possible and is usually delicious local Thai or Shan style, or occasionally Chinese or southern Thai style. Meals will start with one or two types of fruit and usually some salad. Nam Yang Kung Fu Retreat then typically serve two main dishes with rice. Most dishes are vegetarian but Nam Yang Kung Fu Retreat does serve meat. There will always be at least one vegan dish as part of each meal. Nam Yang Kung Fu Retreat will also try their best to cater for specialist diets. Drinking water is supplied with meals and is available from the kitchen free of charge at any time for resident students. They also serve specialist teas two to four times a day. Either high-quality Chinese tea - something integrally connected with Kung Fu training - or herbal tea for health benefits. The instructors eat in the dining area, together with the students, which is a testimony to the quality of the food and helps provide a good ethos for the school. Meal times are therefore ideal for discussing Kung Fu and asking questions. Almost any style of food can be purchased in Pai, (Italian, Western, Middle Eastern, Chinese, Indian, and many more). The local diet is based mainly around rice, meat, fresh-water fish, vegetables, fruit, and spices. Kindly note that seafood is relatively expensive in the mountains. Local fruit and vegetables are great, fresh, and very cheap. There is a masseuse available on call who specializes in traditional Thai massage, herb massage, and oil massage. The cost of the massage is from 200 TBH per hour. Compared to prices in the West, this is ridiculously cheap! Head out of town towards the airport or Mae Hong Son. On the far side of the airport turn right, parallel to the runway. Nam Yang Kung Fu Retreat is the first turn on the left, about 400 meters down the road, on a right hand bend. Nam Yang Kung Fu Retreat has a prominent sign. Please book your flight to arrive at Suvarnabhumi Airport (BKK) or Chiang Mai International Airport (CNX). Arriving at Chiang Mai is much nearer to the Kung Fu Retreat but Bangkok has more flights and is usually cheaper. Once in Bangkok, you can book a domestic flight to Chiang Mai. Transfer from and to the airport is available upon request. If on a budget, Nam Yang Kung Fu Retreat recommends you fly to Bangkok to Chiang Mai, then to take a minibus / Aya Service to Pai and a taxi to the retreat from there. The flights from Chiang Mai to Pai Airport (PYY) are currently no longer available. For airport transfers from Chiang Mai to the retreat, Nam Yang Kung Fu Retreat can arrange a taxi from Chiang Mai Airport (CNX) to the retreat for around 4100 THB (131 USD). Once you arrive in Bangkok, you can get an overnight sleeper train from Bangkok’s central station, Hua Lam Phong, for around 1,000 THB each way. Booking in advance is recommended. Please be aware that trains in Thailand often run very late. The trains are very comfortable and afford great views of the Thai countryside. Minibusses run between about 7:30 a.m. and 5 p.m. If you arrive in Chiang Mai later than about 3:30 p.m., you are likely to need to either stay overnight in Chiang Mai or get a taxi to the Kung Fu Retreat. If staying overnight, which is the cheapest option, it is recommended that you still go to the AYA Service office when you arrive and book a minibus for the next day. Then look for a guesthouse nearby. You should get a nice room with fan for 400 to 500 THB. Nam Yang Kung Fu Retreat can arrange for a taxi to come to the airport to meet you. Alternatively, you could speak with drivers in the taxi rank outside the airport but Nam Yang Kung Fu Retreat recommends you settle on a price before heading off. If Nam Yang Kung Fu Retreat arranges a taxi for you, they will need to pay in advance so please do not pay the driver otherwise he will think that he has just got the best tip of his life and likely take a week off. Airport: Chiang Mai International Airport Airport transfer available: Chiang Mai International Airport (US$131 per person) Additional charges may apply. You can request this in the next step.